Online co-op is not available in the Mac App Store version (LAN co-op is supported). Can be forced on through video card control panel. Only available in the console versions. Not available in the Mac App Store version. 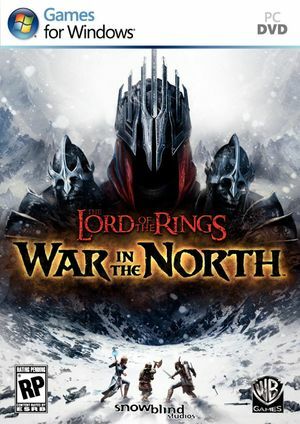 See Helix Mod: Lord of the Rings - War in the North. Some players report bright flickering effects during Chapter 3 and 6 of the game. The game conflicts with Windows 10's Tablet Services, resulting in frequent crashing until they are shut down. Quit the game if it is currently running. Right-click the Windows icon on the lower-left corner of your screen. Select Task Manager from the menu which appears. On the window which appears, if in the lower-left corner of the window you see an arrow as well as the words "More details" next to that arrow, click the arrow. Under Background Services, end any tasks which begin with Tablet (case-sensitive). ↑ 1.0 1.1 File/folder structure within this directory reflects the path(s) listed for Windows and/or Steam game data (use Wine regedit to access Windows registry paths). Games with Steam Cloud support may store data in ~/.steam/steam/userdata/<user-id>/32800/ in addition to or instead of this directory. The app ID (32800) may differ in some cases. Treat backslashes as forward slashes. See the glossary page for details. Before running the game, right click on the taskbar to open up the Task Manager. Looking at the Processes tab scroll through Background processes untill you find "Tablet Service" and any other Tablet related tasks. End these tasks. This will solve the issue." This page was last edited on 14 April 2019, at 09:29.